After original venue Bogiez shut down, Leaves’ Eyes were forced to move their concert to The Globe: a very small former theatre in a largely residential area of Cardiff. It seems a strange place for the huge and epic sound of one of symphonic metal’s greatest bands, but many fans are grateful to get an up close and personal view. Atrocity are on first, and as a death metal band they might seem like a strange choice to anyone who only knows them musically. But in fact they are made up of the entire line-up of Leaves’ Eyes, minus Liv, so it’s a good chance for them to get an outing. They play a mixture of old and new songs (as singer Alex Krull mentions, they’ve been going since 1985) and quickly have most of the crowd headbanging enthusiastically. It’s a fun aspect of the tiny venue that at one point they are able to grab two girls from the crowd to join them on stage for a spot of metal dancing. Next up is Pythia, bearing the torch for British power metal and led by Emily Alice Ovenden, who is wearing a rather badass suit of armour. They put on a great show, though on this occasion Emily’s vocals were somewhat lost in the mix and you could only really hear the power of her voice in the quieter moments. As this was their first show of the tour, fans were pleasantly surprised to hear some new material from the upcoming album, though as a short supporting set this meant that we didn’t get to hear some old favourites like Sarah (Bury Her) and Tristan. All of this has the audience in a good mood for Leaves’ Eyes, who take the stage to a sumptuous orchestral opening followed by Galswintha, a song from their latest album Symphonies of the Night that showcases the band’s effective mix of symphonic and folk metal. Although this is the tour for Symphonies, (which is a brilliant album, by the way), the set isn’t over-burdened by new songs, and they’ve made sure to mix in plenty of fan favourites like Take The Devil In Me, Elegy, My Destiny and Farewell Proud Men. 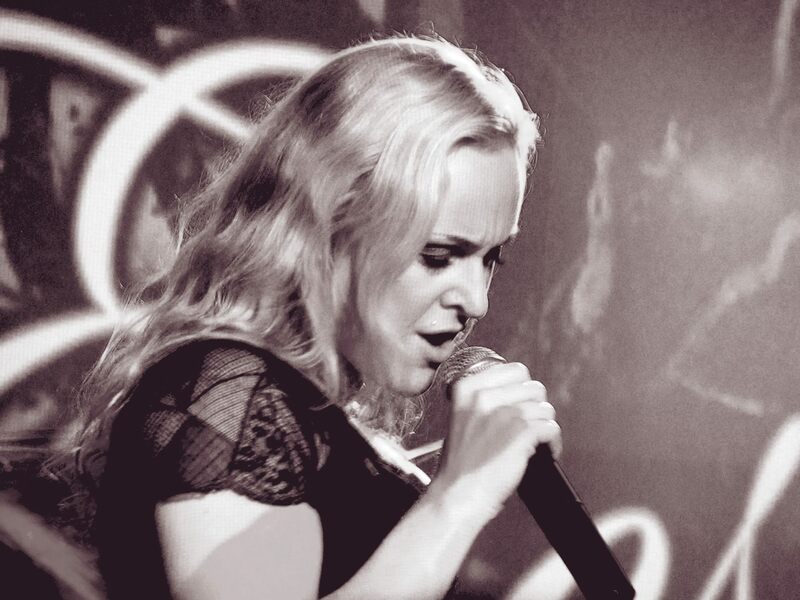 There is something undeniable special about Liv Kristine’s gorgeous vocals, and it comes across even better in a live setting. This is not least because you can witness how talented she really is, consistently hitting super high notes with apparent ease. Even in the symphonic metal world there are few singers who can truly perfect their live singing, but Liv has had plenty of practice having been in the business since 1994 with her first band Theatre of Tragedy. Alex Krull, her husband, brings a harsher side to the music which works wonderfully in the beauty and the beast style that Liv pioneered. As the band close their show with their Norse epic Frøya's Theme, it is clear that the band have enjoyed themselves greatly, as have the crowd, who all seem thoroughly impressed with the performance. Leaves’ Eyes are certainly more than worth seeing live, and what the small venue lacks in size, lights and sound it makes up for in intimacy. Liv steps down from the stage and wanders through the crowd to the merch booth, ready to sign CDs and have a chat with their fans. You don’t get that at the O2 Arena!